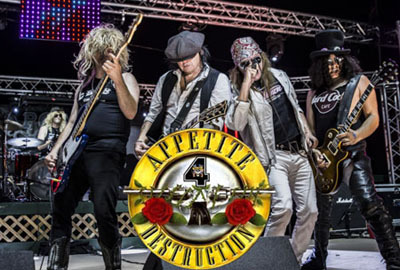 Appetite 4 Destruction available for Corporate Events, clubs, fundraisers and parties. Greetings, We hope to establish a great relationship, and to provide high quality professional entertainment for you. Do you think that you can consider booking Appetite 4 Destruction to perform our exciting Guns N' Roses tribute show? You really should check us out. All information about us is at our website. Bio, Excellent video, pictures, Press Kit, Venue list, Social Media, Etc..
For booking a performance and further details. Please reply back to our email.